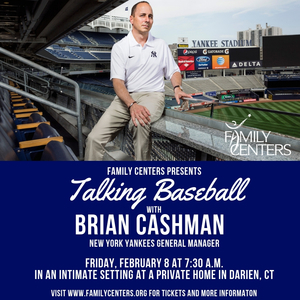 On Friday, Feb. 8, Family Centers will welcome New York Yankees General Manager Brian Cashman for candid discussion in advance of the start of the 2019 Major League Baseball season. Held at a private home in Darien, the breakfast event begins at 7:30 a.m. and will directly support Family Centers network of health, education and human service programs that assist more than 21,000 Fairfield County children and families each year. A very limited number of tickets are available to this intimate event. During his remarks, Cashman is expected to offer his outlook on the Yankees' 2019 campaign, provide first-hand perspective on the team's off-season moves and share stories of classic games and his interactions with Yankee greats. Visit www.familycenters.org/product/Cashman for more information or to purchase tickets. Venue location will be disclosed at time of ticket purchase.